With summer in full swing, there’s nothing better than a dose of sand and surf to soothe your family’s souls — and their toes. So, pack your sandals, sunscreen, beach toys and bathing suits — and head out for some much-needed fun in the sun. But before you sink your toes into the sand, read these 10 beach safety tips to ensure you and your family have an unforgettable — and hazard-free — vacation. Don’t let threats like death-defying rip currents, damaging sunrays or dangerous sea creatures get in the way of making memories that will last a lifetime. Obey posted signs and warning flags. Posted signs are intended to keep you and your family safe from hazards and alert you of changing conditions throughout the day. However, beach flags can mean different things from place to place, so be sure to check with a lifeguard if you’re unsure of the conditions. In general, a red flag means the water conditions are severe, and you shouldn’t enter. A yellow flag means there’s a lifeguard on duty. Other flags may warn against water quality and marine life concerns. Check the weather and radar. Storms can pop up very quickly at the beach, so make sure you’re ready for a quick relocation to shelter. Avoid the beach if there’s any lightning in the forecast, and wait at least 30 minutes after the last thunder boom before heading out to the beach. Also, the ocean floor can drop off unexpectedly, so make sure your kids don’t swim out too quickly. If they’re using a float or a raft, be aware that currents can take them out away from the shore. Lastly, never take your eyes off your child, not even for a second, while playing on the beach. The water is very tempting for young kids. In the time it takes you to turn around and grab the sunscreen, a toddler can be in the water. Choose a spot close to a lifeguard. Lifeguards are not only added protection for your kids while swimming, but they also assist us all by identifying rip currents and other dangers in the water before we do. Another benefit to locating near a lifeguard is it makes your spot in the sand identifiable from the water. Avoid rip currents. According to the United States Lifesaving Association, about 80 percent of rescues by its affiliated lifeguards at ocean beaches are caused by rip currents. They can form in any large open water areas very quickly, so be sure to check conditions before entering the water. Educate yourself on drowning dangers. Drowning is the leading cause of death for children ages 1 to 4, according to the U.S. Centers for Disease Control and Prevention, and most occur in unguarded areas at the beach. Be aware that, contrary to popular belief, drowning looks very different in real life than it does in the movies. Trnka recommends parents consider the Water Watcher strategy. This means one particular adult is solely focused on the kids in the water, and not reading or socializing, for a certain period of time (i.e., 15 minutes) to prevent lapses in supervision. Keep a lookout for sea creatures. Remember, the ocean is home to thousands of plants and animals, some of which can be dangerous. So, remind your kids to avoid patches of plants and leave animals alone. In particular, be mindful of the dreaded jellyfish, sea crabs and sharks. Though there are very few shark bites in the United States, obviously it’s a good idea to steer clear of them. More likely are the stings of a jellyfish, which can be very painful. Most can be treated at home and do not require medical attention, but monitor your child for allergic reactions, such as breathing trouble. Keep your kids well hydrated. Remind your kids to drink plenty of water, and have snacks on hand to avoid dehydration. It is very easy to get dehydrated under intense sun at the beach, where there’s little shade. The American Academy of Pediatrics recommends young kids who are playing require at least 10 gulps of water every 20 minutes of play (1 gulp = ½ ounce of fluid). More is recommended for older kids. Protect kids from the sun’s rays. 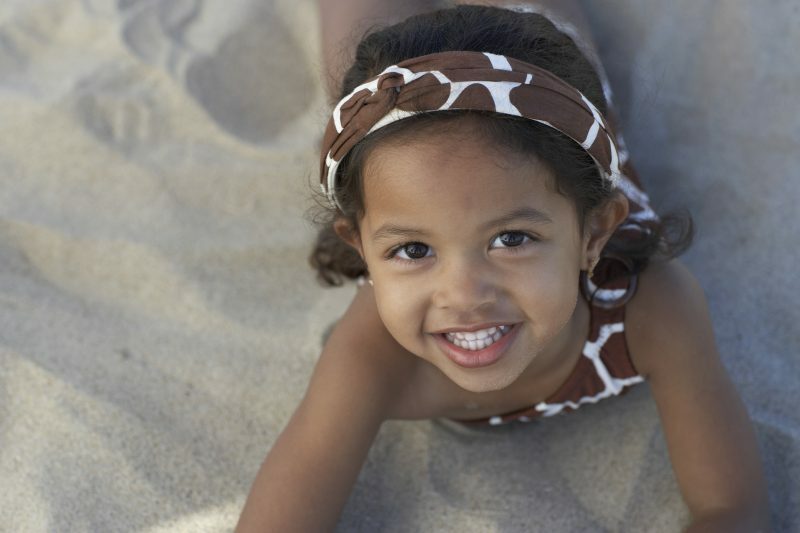 To protect your little one’s sensitive skin, apply sunscreen 30 minutes before heading out to the beach. The American Academy of Pediatrics recommends using broad-spectrum sunscreens (blocks UVB and UVA rays) with a sun protection factor (SPF) of at least 15. Also, don’t forget lip balm with an SPF of 15 or more, too. In addition, kids 6 months and older should wear sunglasses to protect their sensitive eyes from the sun’s rays. Look for sunglasses that offer 99 percent UVA and UVB protection and are shatter-resistant. Lastly, don’t forget a wide-brimmed hat to shield their eyes, face and neck from the sun. Set a timer to reapply sunscreen. Nothing can ruin a beach vacation like sunburn. For complete protection, sunscreen should be reapplied every 2 hours, or more often if your child is sweating or swimming. Remember, when your child is in the water, sunscreen will not offer protection for as long a period, if at all. If you’re using water-resistant sunscreen, read the label and follow the directions for recommended reapplications. In the unfortunate event that something does occur, make sure you have your child’s medical records on hand if you need to seek medical attention while traveling. MyChart Mobile makes it easy because a list of all your child’s medications, allergy history and other pertinent information is all in one place. Plus, the option to message your doctor with questions or request prescription renewals while you’re away is in the palm of your hands.